This semester I’m taking a course called “America and the World since 1865,” which looks at the U.S. from a transnational perspective, its influence on the rest of the globe, and vice versa. For our first meeting, the professor asked us for a very brief reflection on whether our own historical thinking has been contained within national borders, or if we’re used to thinking of history in broader, more international terms. For the most part, my historical thinking has been confined within national boundaries. As an aspiring early Americanist, my reading and research has generally focused on the U.S. itself. My undergraduate advisor was interested in Peter Kolchin’s comparative work on American slavery and Russian serfdom, and it struck me at that time as a very novel way to approach historical questions, but the U.S. as a sort of discrete unit of study is something I’ve generally taken for granted. The only real exception has been the work I’ve read by colonial American specialists operating from an Atlantic perspective and colonial historians writing about the borderlands between the different European colonial societies. I haven’t really incorporated these insights into thinking about my own research interests, which involve the American Revolution on the frontier. I’m certainly not hostile to a more international approach; I simply haven’t thought much about it. This neglect has carried over into my teaching. As an adjunct, I’ve tried to incorporate some insights from world history into my U.S. survey courses, but this has been limited to the predictable topics—nineteenth-century imperialism, for example, or America’s role in the World Wars. Of course, American survey courses generally concentrate more on the impact of such overseas involvement on the U.S. itself rather than the results of American foreign involvement on the receiving end, and the survey courses I taught were no exception. This “U.S.-centric” approach to teaching about America’s engagement with the world isn’t really true international history, but at least it helped internationalize my thinking a little; teaching the U.S. and world surveys at the same time prompted me to consider how American imperialism of the late 1800s and early 1900s was similar to the European imperialism of the same period. The upshot of all this is that borders have bound most of my historical activity up to this point, and I suspect this is true of many Americanists. This course will probably be an eye-opener for me, and I hope it will spur me to think a little more broadly about the forces that have shaped human activity. 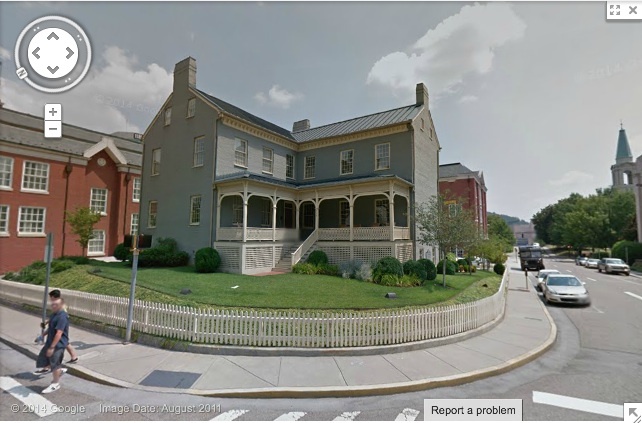 The second oldest home in Knoxville is the James Park House, located downtown on Cumberland Ave. Google Street View doesn’t really do it justice, but it’s better than the photo I tried to take with my phone while stopped at a red light a couple of days ago. I wanted to snap a picture of the Park House because it’s got an interesting connection to John Sevier. “Nolichucky Jack” didn’t live here, but it wasn’t for lack of trying. Sevier purchased this downtown lot and started building a home there in the 1790s, around the same time he was serving as Tennessee’s first governor. Construction didn’t get very far. Nothing but a brick foundation and part of a wall had been completed before a financial setback forced Sevier to abandon the project. For a man so accustomed to winning, whether on the battlefield or in politics, it must have been an irksome disappointment. He sold the lot to his son G.W. Sevier in 1801, and it passed out of the family’s hands six years later. James Park, an Irish immigrant and Knoxville mayor, bought the lot and built the current structure on Sevier’s foundation in 1812. The house stayed in the Park family for a century; after that, it served time as a Red Cross facility and a medical academy. Gulf & Ohio Railways acquired it to use as a headquarters building a few years ago and undertook an extensive restoration. Although Sevier never got to build the home he wanted on the lot, it’s just a stone’s throw from the courthouse lawn where his remains were reinterred in the 1880s. One fellow who did get to spend some time in the Park House was Sevier’s mortal enemy Andrew Jackson, who stopped by for a visit in 1830. In a sense, the story of the house lot on Cumberland Ave. mirrors the larger story of Sevier’s place in Tennessee’s history. In both cases, Sevier secured the land and laid the foundation, but it was left to others to build up the structure, which obscured and overshadowed the contributions of the man who made so much of it possible. And in both cases it happened around the same time. While James Park was building his house in 1812, Sevier’s great rival was on the brink of national fame and state preeminence, but Sevier himself was in the twilight of his long and very eventful life. Because if there’s one thing a longtime Whig like Lincoln couldn’t stand, it was capitalism, right? Religious right broadcaster Kevin Swanson agreed with one of his guests that Abraham Lincoln imposed socialism on the United States during the “war against the South” – more commonly known as the Civil War. Although some well-known house museums are thriving, many smaller and more obscure places are struggling. Their plight is so drastic that some preservationists are now making an argument that sounds downright blasphemous to defenders of these charming repositories of local history: There are simply too many house museums, and many of them would be better off closing. I’m probably not the most impartial observer here, because I used to run a historic house museum and now I’m on the board of another one. But I think we need plenty of small HHMs, and here are a few reasons why. HHMs give small communities access to the museum experience. People in urban areas shouldn’t be the only ones whose lives are enriched by having a cultural institution in the neighborhood. They help instill a sense of local pride in small communities, a feeling of ownership of one’s past and one’s own place in the world. Small HHMs help nurture a well-rounded view of the past by reminding us that history isn’t always about great men, grand buildings, and dramatic battles. Critics who wonder why anybody would spend money maintaining the home of Joe Schmoe, an ordinary nineteenth-century lawyer from Podunk, are missing an important point. HHMs of that sort are important precisely because Joe Schmoe’s life was ordinary and unexceptional. The palatial homes of the rich and famous tend to be the ones that endure, but most of our ancestors weren’t living at Tara. It’s the mundane aspects of the past that tend to get lost in the shuffle. HHMs are still one of the beast means to keep historic structures intact. The Globe article notes that you can keep a historic house standing even if it’s no longer functioning as a museum. That’s true, but I can’t think of many alternate uses where the integrity of these buildings is such a priority, and where preservation is done so well. HHMs are training grounds for the employees of other cultural institutions. A lot of the people who are running the bigger museums, historical societies, and preservation organizations first got their start in some small HHM. When young folks looking for a career in public history ask me for advice, I always tell them to find some small institution in their own neck of the woods and start volunteering or doing part-time work there. Just about every public history job posting is going to require one thing of applicants, and that’s experience. There’s no better place to get your feet wet than at a small site where you can wear a lot of hats. A lot of small historic house museums are teetering on the brink of closure, and no doubt many of them are beyond saving. But the answer to the precarious state of small HHMs isn’t to cull the herd. What we need is to foster close cooperation among smaller house museums, to make sure that historical and museum organizations keep these smaller sites on their radar, and to encourage professionalism and dedication among the people who oversee small HHMs so that the directors, curators, and site managers have what they need to do their jobs and keep the doors open. When a historic home closes and a community loses access to a piece of its own past, it’s not a Darwinian winnowing out of the public history profession. It’s a small tragedy. Is the Stockbridge Massacre site a good place for a dog run? No, it isn’t. But they might put one there anyway. The proximity of a proposed dog run in Van Cortlandt Park to the site of a Revolutionary War massacre has sparked criticism from a group of Bronx historians. The dog run — set to be built in the park’s Northeast Forest section — will replace the current makeshift dog run that occupies a space approximately 50 feet to the north of a memorial commemorating the site of the Stockbridge Indian Massacre of 1778. Wording on the memorial states that during the battle, British troops killed 17 Stockbridge Native Americans allied with Revolutionary soldiers, though historians say that enlistment records and reports from those who fled put the number closer to 40. Members of the Kingsbridge Historical Society (KHS) liken the placement to putting a dog run next to the Vietnam Memorial or the Tomb of the Unknown Soldier. As if this whole proposal wasn’t cringe-worthy enough already, let me add that the bodies of the men killed that day were scavenged by dogs before being buried in a common grave. Yeah. Really not the most appropriate place for a canine playground, is it? On a side note, a Hessian officer who saw the bodies of the Stockbridge militiamen killed in the attack produced this image of their clothing and arms, giving us a firsthand glimpse of these Patriot-allied Indians. 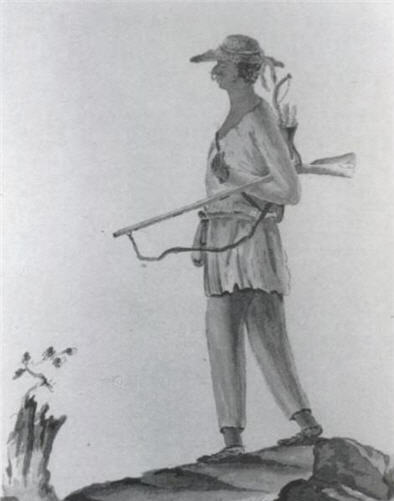 Note that he’s carrying a bow and arrows as well as a musket.